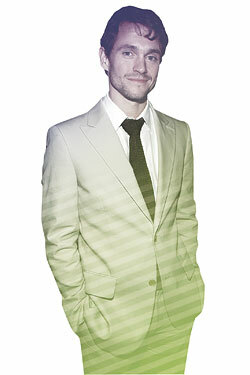 Hugh Dancy has cornered the market on floppy-haired British heartthrobs. In his last three films, Evening, The Jane Austen Book Club, and Confessions of a Shopaholic, he’s played a boy-man with a big (if vulnerable) heart. He gets to do that again in Adam (opening July 29), one of the few films picked up at this year’s Sundance Festival. But here’s the rub: This time the boy-man has Asperger’s syndrome, a high-functioning form of autism. Dancy spoke with Emma Rosenblum. Were you immediately attracted to Adam? I knew nothing about the script when it arrived, and I got about a third of the way in and started thinking, There’s something going on with this character that I can’t put my finger on. Then, of course, his condition is revealed, and that was an intelligent way to write a script, to allow for confusion at the beginning. Ninety-five percent of scripts you read run in terror from any kind of ambiguity. I knew nothing about Asperger’s at all, but that didn’t really worry me, because I could tell from the writing that the story was good, and then I met [writer/director] Max [Mayer], and trusted him instantly. Adam and his neighbor, Beth [played by Rose Byrne], fall in love. I hope you won’t be offended if I say that I spent most of the movie wondering what the heck she was doing with him. I think, realistically, it would take a fairly unusual person to date someone with Asperger’s. And I hope you won’t think I’m crass if I add that it would’ve been even harder to buy this love story if Adam had been played by someone unattractive. Was Adam tougher than your average rom-com? Confessions of a Shopaholic was fun, but it was bloody hard work. In Adam, the script was solid; Confessions literally changed day by day, line by line. It was a Disney–Jerry Bruckheimer film, and there were a lot of cooks, which became incredibly frustrating. How much did you study Asperger’s? I had to do detailed and specific work about this guy so he didn’t end up being a series of quirks. When I initially read that first bit of script, I thought, Jesus, I hope this isn’t one of those scripts where it turns out he’s just a little off, but he’s kind of wonderful and is going to teach us how to be better and more simple people. Because I kind of hate that. You know what they say about actors playing characters with disabilities: Oscar bait! Honest to God, that didn’t occur to me. My basic assumption was that the movie was so small nobody would see it.